So if pricing is a market signal, what message is the free edX sending out to consumers and suppliers of higher education? 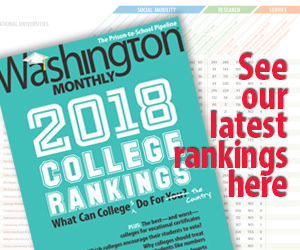 To answer that, it’s worth pointing out that there are many reasons that people apply to these top colleges – and among those reasons, free edX sends a signal that knowledge of an academic subject is nowhere near the top of the list of what is important to parents who are making the tuition payments. What Harvard and MIT and the other globally-leading schools offer students are two priceless assets – branding and professional networks. Branding means that the most exclusive club in the world has decided that you have the magic combination of brains and personality that will result in exceptional career accomplishment. And their alumni networks occupy top positions in fields that matter to their students – thus providing students with access to opportunities they would not otherwise have. As long as students who take edX are blocked from the branding and professional networks that their parents pay so dearly to obtain, such top schools have nothing to fear from giving away what the teachers are getting paid modestly to deliver. Right. The vast majority of what college students learn could be learned differently and less expensively. College degrees exist in large part as a signalling mechanism to employers—”Oh, he completed four years at Harvard? He must have been smart to have gotten into and through such a difficult institution”—not to mention, in many circles at least, potential friends and romantic partners. Of course, things get icky when you realize that class still plays a huge role in undergraduate admissions to the Harvards and Yales of the world (partially via their preference for legacy applicants). Or when you think about about grade inflation. So the moral here is that the normal, non-college-attending folks can have all the free education they want. Until we think about what these credentials mean differently, this access to free learning isn’t going to have much of an impact on social mobility.